September signals the end of the baseball season. It also inspires me to want to organize the assorted baseball cards, pocket schedules and other odds and ends I’ve accumulated over the past six or seven months. Above, you are looking at a corner of my desk that I haven’t gotten to yet. I would like there to be less baseball cards in the house than there are now. I would also like the ones that stick around to be cards that I am actually interested in. Who wants to help out? Let’s make some trades this month. 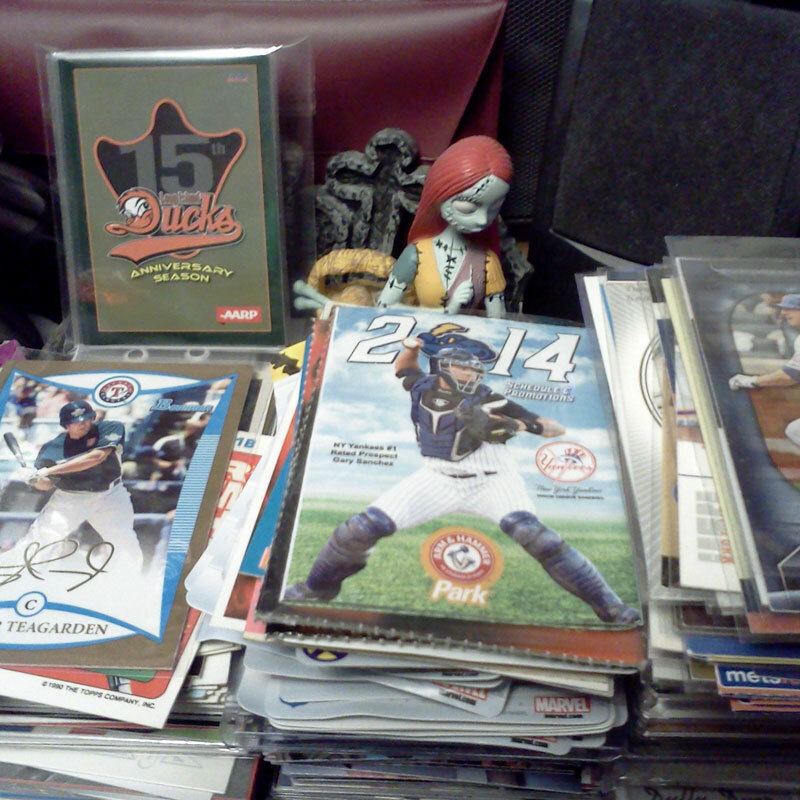 If you’ve got some favorites player(s) that you collect, I’ll probably be happy to send you whatever cards I’ve got. (There won’t be any autographs, relics or rare serial-numbered cards in the mix, but you could end up with some nice inserts or rookie cards.) I’ll show you what you are getting, and you can decide if you you want the cards and what you think is a fair trade. Have a favorite team that you collect? I can probably send you a lot of anywhere between 50 and 200 cards from the 1980s to 2013. (This will take a little longer – my cards are sorted by player – and may not include certain stars if someone asked for them already.) I’ll give you an approximate count, but once I pull a team lot, you are going to get it — I don’t want to sort them back into the boxes again. Working on a set from 2002-2013? I’ll take a look to see what I might have to help you, as long as your wantlist includes player names (remember, my cards are sorted by player, not set/year.) Also, if by some odd chance you are building a 1989 or 1990 Bowman set, a 1988, 1989 or 1990 Score set, or a 1982, 1987, 1989, or 1991 Fleer set, feel free to send a numerical want list – I can probably help you out a lot. I’ll take pretty much any of the above – my goal is to make room in my card boxes so I can finish cleaning off my desk, so you don’t even have to worry about matching quantity. Just send me something that you think I’d like. Paul, I still have that autographed Gene Clines 1976 Topps I offered you a while back. (you already had it) I would be willing to trade it for a small stack of Oakland A’s. Email me your address and I’ll pop it in the mail. I have a few other autographs I can throw in as well since I only collect A’s players. Sounds good – I’ll send you my address & get some A’s cards out to you this weekend. I’d be interested in any Cubs cards you might have. I can pull out some Mets cards, and maybe some others on your list. I also have a couple of baseball autographs you might want, including Jay Johnstone, Andre Dawson, and maybe some others. Let me know if you’re interested. You’re welcome to my Cubs cards, though I’m not sure if I have anything that would be worth an Andre Dawson autograph. Let me find the autographs I do have and let you know. Found a stack of about 100 cards or so. Lots of funky ones you might not have seen before. Craig Grabeck of the White Sox is the only auto I have. If you email your address to me at rlincolnharris@gmail.com I’ll send them along. Thanks. I’d be interested in Blue Jays cards. For baseball autographs, all I have is Mike Fitzgerald and Pat Listach. I could find some OPC Mets from 70 and 80’s in exchange. hi Paul like you I collect Mets card my goal is to have at least one every met in a Mets card. just when I think I complete I discover another card the other day found about the 2008 Topps Mets factory set. it came with a 5 card set it is advertised as having a Brady Clark card when I ordered on the cards I the card that should’ve been Brady Clark (3 of 5) was Nelson Figueroa. a nice surprise since I did not have him but no Brady Clark. I can’t find this card anywhere my question is does it exist is it a typo. if you got or know anyone who does help me out. I remember the 2008 Topps factory sets with the five bonus Mets cards, but I never bought one. All of the checklists I’ve seen list card #3 as Brady Clark and do not include Nelson Figueroa at all, but obviously they are wrong.